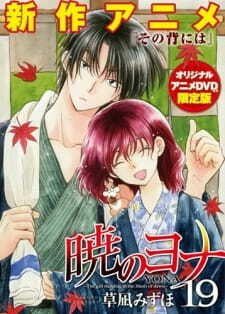 The first episode adapts two bonus chapters from Mizuho Kusanagi's 12th manga volume, titled "On That Back" and "Kija." "On That Back" follows an incident at a hot spring hotel, and "Kija" depicts the past of the Hakuryuu Kija. The second two episodes adapt the rest of the Zeno Arc and were bundled with the 21st and 22nd volumes of the manga. If you care about this anime, watch the OVA. You wont regret it. OVA's are normally an excuse to add fun useless filler to a story. This is not one of those cases. The first episode may seem like that, but the second and third are NOT. The last 2 eps are fairly critical to understanding a specific characters backstory and existence. It is not to be looked over if you are invested in the story. They could/SHOULD have started the second season with those 2 eps. The first episode is classic OVA - the hot spring episode. Its cute and fun, but we learn a little into the familial background of the White Dragon. So I would watch it. Other than that its pretty light. The second and third eps. It beings fairly light and playful and dives into the history of the Yellow Dragon. In the series we get 2 full episodes with him in it. This OVA ep is crucial to understanding more about the original dragons, their relationship with each other and the king, the yellow dragon, and the beginnings of the current political system. They should have used this as the introduction to the second season it would have been brilliant. The first episode is an animation for a bonus chapter. And if we've ever read/watched a bonus chapter it's only natural to expect there to be fancervice. Isn't that what a 'bonus' chapter is about anyway? So I don't think it's really fair to rate episode 1 badly solely for this reason. Actually, there isn't as much fanservice as people claim there to be in the first case. Most of the episode actually focusses on more on Ki-ja's past. The main purpose of this review will be to prevent future viewers from dismissing the ova after the first episode. Despite being fully aware that the first episode is a bonus without any significant meaning to the original series, it disappointed me and lowered my expectation for the other two episodes. I'm glad I didn't drop it. The original 24 episode TV series did not fully appeal to me as it lacked to follow the dramatic scenario set in the first couple of episodes during the rest of the anime. What made me continue watching the anime was not the story, but the character development. The 2nd episode extends that appeal by providing a backstory of the origins of the four dragons. The weakest point in the original TV series was the abrupt ending it imposed after meeting the yellow dragon. Unlike the other dragons, the yellow dragon seemingly came out of nowhere, with the anime ending without any sort of development in his character. The 3rd episode of the OVA appeased my disappointment, providing a level of story and character development greater than the entirety of the 24 episode series within the span of only one. The ovas portrayed Zeno’s past and origin delivering a message about life , time, bonds, memories and love. With Zeno’s story the ova series explored more about the legend of the 4 dragons and brought forth to the viewer the image of king Hiryuu and his companions. The story is told from Zeno’s perspective and it portrays the sufferings and cruelty the 4 dragons gone through along their king Hiryuu to protect the kingdom of Kouka. From each experience that Zeno goes through he learns more about his power and how short and precious life is. He also learns about how cruel and unforgiven the passing time is with humans. The ova also portrays aspects from the human drama like illness, death, hunger, through Zeno’s experiences. The ova puts a strong accent on memories on how precious are those memories for us humans. All is portrayed with the help of a golden necklace that Zeno received from his master Hiryuu. That necklace represents his identity , his bond to his past and his resolve to move on in this cruel world were he was destined by fate to be alone and witness the cruel pass of time.